Competition is for incompetents—an ode to monopolies. What valuable company is nobody building? This question is harder than it looks, because your company could create a lot of value without becoming very valuable itself. Creating value isn't enough—you also need to capture some of the value you create. This means that even very big businesses can be bad businesses. For example, U.S. airline companies serve millions of passengers and create hundreds of billions of dollars of value each year. But in 2012, when the average airfare each way was $178, the airlines made only 37 cents per passenger trip. Compare them to Google, which creates less value but captures far more. Google brought in $50 billion in 2012 (versus $160 billion for the airlines), but it kept 21% of those revenues as profits—more than 100 times the airline industry's profit margin that year. Google makes so much money that it is now worth three times more than every U.S. airline combined. "Perfect competition" is considered both the ideal and the default state in Economics 101. So-called perfectly competitive markets achieve equilibrium when producer supply meets consumer demand. Every firm in a competitive market is undifferentiated and sells the same homogeneous products. Since no firm has any market power, they must all sell at whatever price the market determines. If there is money to be made, new firms will enter the market, increase supply, drive prices down and thereby eliminate the profits that attracted them in the first place. If too many firms enter the market, they'll suffer losses, some will fold, and prices will rise back to sustainable levels. Under perfect competition, in the long run no company makes an economic profit. To an economist, every monopoly looks the same, whether it deviously eliminates rivals, secures a license from the state or innovates its way to the top. I'm not interested in illegal bullies or government favorites: By "monopoly," I mean the kind of company that is so good at what it does that no other firm can offer a close substitute. Google is a good example of a company that went from 0 to 1: It hasn't competed in search since the early 2000s, when it definitively distanced itself from Microsoft and Yahoo! Americans mythologize competition and credit it with saving us from socialist bread lines. Actually, capitalism and competition are opposites. Capitalism is premised on the accumulation of capital, but under perfect competition, all profits get competed away. The lesson for entrepreneurs is clear: If you want to create and capture lasting value, don't build an undifferentiated commodity business. Think about how Google talks about its business. It certainly doesn't claim to be a monopoly. But is it one? Well, it depends: a monopoly in what? Let's say that Google is primarily a search engine. As of May 2014, it owns about 68% of the search market. (Its closest competitors, Microsoft and Yahoo!, have about 19% and 10%, respectively.) If that doesn't seem dominant enough, consider the fact that the word "google" is now an official entry in the Oxford English Dictionary—as a verb. Don't hold your breath waiting for that to happen to Bing. What if we frame Google as a multifaceted technology company instead? This seems reasonable enough; in addition to its search engine, Google makes dozens of other software products, not to mention robotic cars, Android phones and wearable computers. But 95% of Google's revenue comes from search advertising; its other products generated just $2.35 billion in 2012 and its consumer-tech products a mere fraction of that. Since consumer tech is a $964 billion market globally, Google owns less than 0.24% of it—a far cry from relevance, let alone monopoly. Framing itself as just another tech company allows Google to escape all sorts of unwanted attention. Non-monopolists tell the opposite lie: "We're in a league of our own." Entrepreneurs are always biased to understate the scale of competition, but that is the biggest mistake a startup can make. The fatal temptation is to describe your market extremely narrowly so that you dominate it by definition. Suppose you want to start a restaurant in Palo Alto that serves British food. "No one else is doing it," you might reason. "We'll own the entire market." But that is only true if the relevant market is the market for British food specifically. What if the actual market is the Palo Alto restaurant market in general? And what if all the restaurants in nearby towns are part of the relevant market as well? These are hard questions, but the bigger problem is that you have an incentive not to ask them at all. When you hear that most new restaurants fail within one or two years, your instinct will be to come up with a story about how yours is different. You'll spend time trying to convince people that you are exceptional instead of seriously considering whether that is true. It would be better to pause and consider whether there are people in Palo Alto who would rather eat British food above all else. They may well not exist. In 2001, my co-workers at PayPal and I would often get lunch on Castro Street in Mountain View, Calif. We had our pick of restaurants, starting with obvious categories like Indian, sushi and burgers. There were more options once we settled on a type: North Indian or South Indian, cheaper or fancier, and so on. In contrast to the competitive local restaurant market, PayPal was then the only email-based payments company in the world. We employed fewer people than the restaurants on Castro Street did, but our business was much more valuable than all those restaurants combined. Starting a new South Indian restaurant is a really hard way to make money. If you lose sight of competitive reality and focus on trivial differentiating factors—maybe you think your naan is superior because of your great-grandmother's recipe—your business is unlikely to survive. The problem with a competitive business goes beyond lack of profits. Imagine you're running one of those restaurants in Mountain View. You're not that different from dozens of your competitors, so you've got to fight hard to survive. If you offer affordable food with low margins, you can probably pay employees only minimum wage. And you'll need to squeeze out every efficiency: That is why small restaurants put Grandma to work at the register and make the kids wash dishes in the back. A monopoly like Google is different. Since it doesn't have to worry about competing with anyone, it has wider latitude to care about its workers, its products and its impact on the wider world. Google's motto—"Don't be evil"—is in part a branding ploy, but it is also characteristic of a kind of business that is successful enough to take ethics seriously without jeopardizing its own existence. In business, money is either an important thing or it is everything. Monopolists can afford to think about things other than making money; non-monopolists can't. In perfect competition, a business is so focused on today's margins that it can't possibly plan for a long-term future. Only one thing can allow a business to transcend the daily brute struggle for survival: monopoly profits. So a monopoly is good for everyone on the inside, but what about everyone on the outside? Do outsize profits come at the expense of the rest of society? Actually, yes: Profits come out of customers' wallets, and monopolies deserve their bad reputation—but only in a world where nothing changes. But the world we live in is dynamic: We can invent new and better things. Creative monopolists give customers more choices by adding entirely new categories of abundance to the world. Creative monopolies aren't just good for the rest of society; they're powerful engines for making it better. Even the government knows this: That is why one of its departments works hard to create monopolies (by granting patents to new inventions) even though another part hunts them down (by prosecuting antitrust cases). It is possible to question whether anyone should really be awarded a monopoly simply for having been the first to think of something like a mobile software design. But something like Apple's monopoly profits from designing, producing and marketing the iPhone were clearly the reward for creating greater abundance, not artificial scarcity: Customers were happy to finally have the choice of paying high prices to get a smartphone that actually works. The dynamism of new monopolies itself explains why old monopolies don't strangle innovation. With Apple's iOS at the forefront, the rise of mobile computing has dramatically reduced Microsoft's decadeslong operating system dominance. Before that, IBM's hardware monopoly of the 1960s and '70s was overtaken by Microsoft's software monopoly. AT&T had a monopoly on telephone service for most of the 20th century, but now anyone can get a cheap cellphone plan from any number of providers. If the tendency of monopoly businesses was to hold back progress, they would be dangerous, and we'd be right to oppose them. But the history of progress is a history of better monopoly businesses replacing incumbents. Monopolies drive progress because the promise of years or even decades of monopoly profits provides a powerful incentive to innovate. Then monopolies can keep innovating because profits enable them to make the long-term plans and finance the ambitious research projects that firms locked in competition can't dream of. So why are economists obsessed with competition as an ideal state? It is a relic of history. Economists copied their mathematics from the work of 19th-century physicists: They see individuals and businesses as interchangeable atoms, not as unique creators. Their theories describe an equilibrium state of perfect competition because that is what's easy to model, not because it represents the best of business. But the long-run equilibrium predicted by 19th-century physics was a state in which all energy is evenly distributed and everything comes to rest—also known as the heat death of the universe. Whatever your views on thermodynamics, it is a powerful metaphor. In business, equilibrium means stasis, and stasis means death. If your industry is in a competitive equilibrium, the death of your business won't matter to the world; some other undifferentiated competitor will always be ready to take your place. Tolstoy famously opens "Anna Karenina" by observing: "All happy families are alike; each unhappy family is unhappy in its own way." Business is the opposite. All happy companies are different: Each one earns a monopoly by solving a unique problem. All failed companies are the same: They failed to escape competition. Peter Thiel (2014). 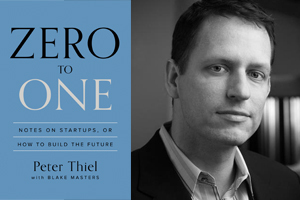 Zero to One: Notes on Start Ups, or How to Build the Future.